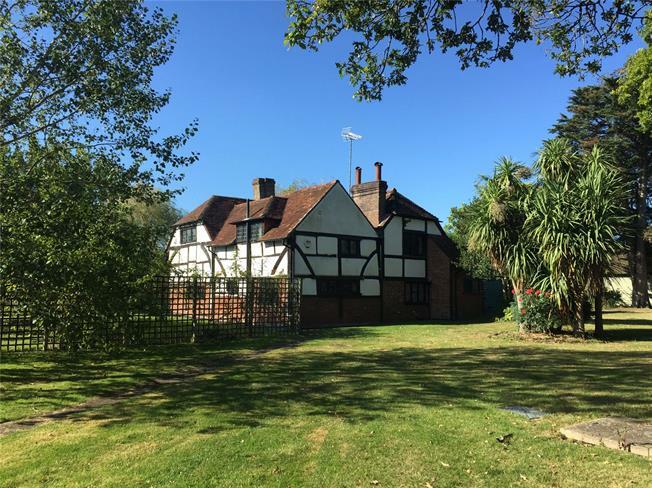 4 Bedroom Detached House For Sale in Horsham for Guide Price £875,000. A beautiful Grade II listed timber framed four bedroom detached 500 year old farmhouse set in a plot totalling 1.472 acres. The house has a wealth of exposed timbers and a fantastic inglenook fireplace. On the ground floor there is a downstairs WC, sitting room, study, dining room and kitchen/breakfast room. On the first floor there is four double bedrooms, two of which have ensuites and a recently re-fitted family bathroom with bath and shower. There are extensive well maintained gardens totalling 1.472 acres including attractive pond and a range of useful outbuildings. There is a detached double garage currently subdivided to provide a store and workshop at the rear. In front of the garage is a stone driveway providing parking for numerous cars. One of the outbuildings is a converted stables that is currently being used as a tool room, utility and store. The other outbuilding is a large pavilion measuring 35ft in length and split into three rooms. It has power and light can be used for a number of potential uses. There is a direct gated access from the rear garden to a footpath which in turn leads to the nearby Downs Link.